About 2 months prior to the show, I sent out my first press release. I am about the furthest from a marketing expert, but I was passionate about this show and I had help from the marketing crew at the venue. The first release was focused on the show itself: what was unique and why would an average person be interested in seeing it. I also included some hi-res press photographs. A month later (still ~1 month out), I sent a follow-up release that was more focused on the (now confirmed) cast, performance dates, ticket prices and info. This had updated photos as well. Between these and some contacts I had, particularly in some smaller online publications I got a couple interviews, a ticket giveaway, and a reviewer coming to our first show. The more people began to cover it, I got the show picked up by a few larger publications. We ended up selling out two of the four shows and getting a great house at the other two. The performances is where the director is really able to let go of the reigns and trust that the preparation was done now. The show now belongs to your cast and crew. I do give a few notes during the run, but mostly on technical issues that help the show to run more smoothly ("Let's try to have the overlords do the house open announcement since they're in make-up at that time"). It's difficult to make major artistic adjustments during the run. If you do, probably better to call a rehearsal and practice than rely on notes. Those of you who have done short runs of theater productions will be familiar with the bittersweet ending to such a production. It has taken over your life, and you will be getting a lot of free time. But you have also built something special and unique and made a new family and that is going away. But like all of theater and improv specifically, its ephemeral nature is part of its appeal. Though it has been more than a year since my last post about this process, I wanted to pick this back up as I have been encouraging more and more people lately to think about projects. 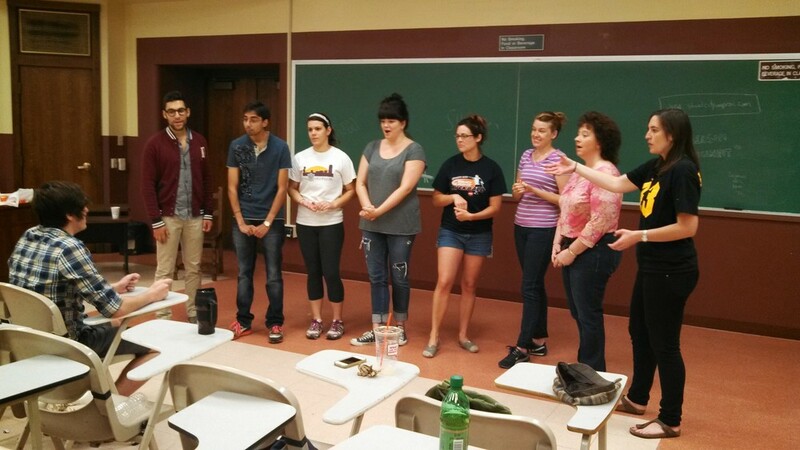 In parallel to rehearsing with my cast, I began work on the tech aspects of the show. Ideally, I would have had a Technical Director to collaborate with on this, but for this show, that was also me. I did, thankfully, have a wonderful board operator at the theater. Final Set Design - Musician would set up stage right, cast on stage and Overlords off stage left with low colored lighting. Projection gave the appearance of looking out of the ship and onto Earth. Tessa Karol as an alien overlord in costume, Hair and Makeup at Tech Rehearsal. Pre-Recorded Audio and Video: This show had a lot of audio/video components. For me this involved sourcing and compiling this content, and in some cases working with artists to create original material. Live Music: Most of the shows had a live synth player adding environmental ambience and underscoring the scenes. We had to find the right place to put her physically in the space, hook her into the board, sound-check and incorporate her into the rehearsal process (for this show, she was just at the tech run through). Set Design: We did not build any sets, but that did not mean that there was no set design. We had two distinct areas of the stage we wanted to set apart, as well as the live music. We played with where to place them physically, lighting options, and incorporating some furniture. Costumes, Hair and Makeup: To clearly distinguish the aliens from the humans in the show, we used costumes, hair and make-up. We had a very low budget, so the costumes were gathered from my and the casts' closets, hair services donated by a cast member, and make up done by a generous local face paint artist in exchange for hanging her art work in the lobby. Pre- and Post-Show Experience: I wanted the experience to begin from the moment the audience entered the lobby. The conceit was that they themselves were an alien counsel and by the end of the show would vote to save or destroy the human race. Before the house opened, they spent their time transforming themselves into their alien alter-egos using tin foil, pipe cleaners, egg cartons, face paint and costume pieces. The end of the show allowed them to vote to save or destroy using their smartphone and watch the vote live on screen, sharing the results on social media. All of these pieces had to be built and organized. They also created two other animations that we played depending on the audience vote at the end of the show. The show ran about 90 mins and had about 20 cues in it. That's probably low to normal for a sketch show but high for an improv show. I wanted to make this as easy as possible for the person in the booth (let's call her the Stage Manager), so I programmed all the cues (audio and video) into an amazing and intuitive piece of software called QLab which you can rent for $3 per day. I rented it for the week leading up to the show and the run of the show and it was remarkably affordable for what it does. With QLab, you can program all of your cues to operate just by hitting the space bar. Cues can play video, put up static images, play audio, do all of those at the same time (which I did frequently), fade sound in and out, time cues to play during other cues and so forth. And it's all pretty easy to set up. Then your tech person will just need to hit the space bar at each cue. Paper Tech: You want to walk through each of the cues with the Stage Manager on "paper." This will be whatever you have for a script. If it is a fully improvised show, this may be more of an outline. But if it is a more ambitious production with technical aspects, you definitely do want to write down clear instructions before the first rehearsal. Cue-to-Cue: Here is where you involve the actors and any other production folks. You want to be in the venue and use all the actual people who will be doing anything on show night. The goal is to walk through each cue, run a little bit before, run the cue, a little bit after then skip to the next cue. I usually use these to also to rehearse entrances, exits, any devices (edits for example) that we may not have rehearsed in the space, where do we stand when we're not in a scene, etc.? Dress: This is a full run of the show in costume, make-up, full tech, top to bottom. This should be treated like a performance. It will also give you a sense of timing. At this point, you should be confident about opening night! 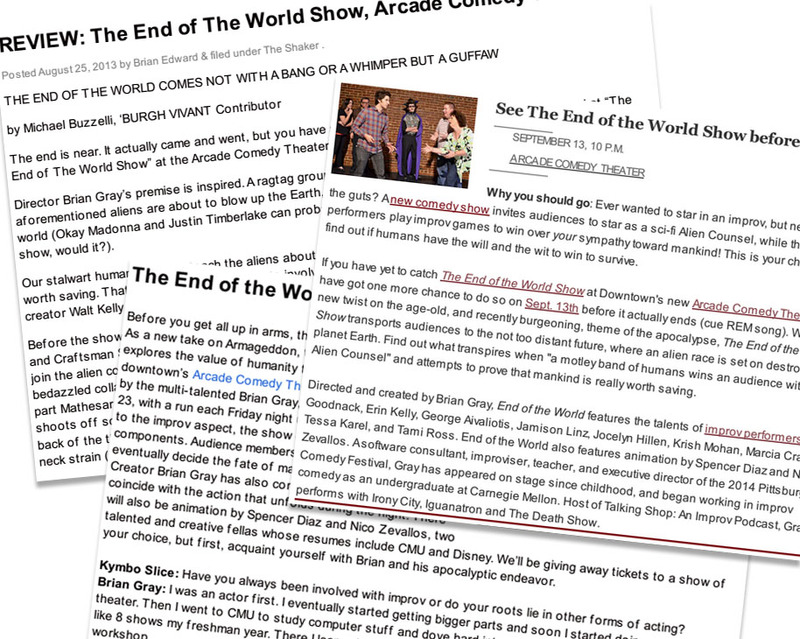 This post is part of a series about creating the End of the World Show. With a refresher read of Directing Improv by Asaf Ronen (contains a lot of useful tips about show process) and a re-listen to the Billy Merritt episode of the Improv Resource Center podcast, I was ready to undertake rehearsals for the show. 2 intense weeks of rehearsal, during which I ask you to make this show a priority. We'll rehearse ~3 days a week. I got people to sign up with the promise of a fun, ambitious show in 2 weeks, but I did not have a lot of time. Character work: actors would be playing the same characters for every show (in the "frame story," in the improv those characters could play anyone). We worked on playing ourselves but slightly exaggerating qualities based on how we would really react if our own world was ending. With collaborators roughly in place, I needed to figure out what was actually going to happen on stage. I had a vague outline in my head, but these things never work how I think they will. I emailed out to 22 people in the community who I thought could have the time and interest to help workshop the show. I got a pretty positive response -- a good chunk of them were willing to help. The idea was to help me when you have time to figure out what this show can be! What did these early rehearsals look like? Much of what we did was workshop games. I've played a lot of shortform games, and I wanted to take a handful of them and figure out how they would or could work in this Alien Show concept. I don't have photos from the exploratory sessions, unfortunately. But here is the cast ironing out some kinks in 2 Min Challenge. This game could be earlier in the show. The humans want to just tell some stories. At various points, something goes wrong. Either the overlords intervene, or maybe they react and the humans intervene, or the humans always intervene as they learn each others' personalities and what the aliens respond to. These "interventions" are our challenges. The game can still retain its fast pace, it's increasingly silly challenges and so forth. We tried a lot of combinations, and ended up with something that didn't even look all that close to what I imagined. It was story based, but often the interjections were helpful. There was usually a mix of how the challenge was interjected. And the humans told their stories more collaboratively than competitively as is the point of the short form version. I loved this spirit of workshopping games for a different purpose. We had a little bit of time, and we worked together to create something once we saw what it looked like. We touched on some of the other major aspects of the show, but most of these early rehearsals were workshopping games. In the first post of this series, I looked at the seed of the idea for the End of the World Show. In this part, I move on to the next step. Specifically, how I began to organize my thoughts, book the venue, and find the cast and other collaborators. An alien race has descended upon the Earth and decided to obliterate the race (enslave us?) and use the planet for its resources (destroy the planet?). One of the alien “teenagers” has fallen in love with an Earthling and has brought her friends to the alien council (presided by some cast members but essentially the audience) to prove the humanity of the human race. Unprepared, the humans play some short form games to entertain the aliens but also prove our human emotions and relationships are worth saving. In the end, the council takes a vote to decide the future of mankind. This poor description changed over the life of the show, but it sold it to the theater, the cast, and many of the collaborators. A cast / rehearsal spreadsheet. I sent an email out to about 20 improvisers I thought might be interested in taking this journey with me. The response was overwhelmingly positive, except for some who were busy. I credit my success for not asking for any commitment early on, and just wanting help figuring out if the show could work. I tracked responses and when people could be at what. Press. This was the first time I had done a lot of aggressive press, particularly "traditional" press. As we were starting to explore the form, I was already writing the first press release and Facebook copy. With advice from Abby Fudor, I started to put together a fun press packet. Masha Fikhman did amazing face paint for the cast and audience. And she hung a few paintings at Arcade. Win win! The rest of the early days were a whirlwind of collaboration. This was a passion project: no one was getting paid; everyone was volunteering time. Why? Often because I could include them in the marketing, sometimes because we could show their work (see photo right), and mostly because it sounded fun. I first connected (through Scott Andrew) with Spencer Diaz and Nico Zevallos who would work on the animation for the project. They were excited to help out, we set some expectations and were off to the races. Next was figuring out music. I talked to Eric Singer -- friend and creator/player of musical robots -- who connected me to Herman Pearl. While neither could help with the show, Herman introduced me to QLab which was the life-blood of the tech and both led to leads on a theramin (that sadly never panned out). Finally I got Michelle Horsley on the hook for live music. At some point, I decided I was ready to really put this up and approached Kristy Nolen, Creative Director and Programming Director of Arcade Comedy Theater about putting up the show. I said that I wanted to do a run of shows where people dress like aliens and care about each other and there's a lot of tech and press and Kristy said, "Yes! How can we help?" All 5 of the Arcade directors helped make the show a success with creative help, marketing, design, use of the space, and so on. We were now in motion! I have a list of 39 people who contributed to the project and I apologize that I don't have time to discuss all of their contributions here. I want this series to be a little bit about End of the World and a lot about what worked in case you want to create your own ambitious show. Suffice it to say I really could not have done it without those 39 people. I've been hard at work: at my job, the Pittsburgh Comedy Festival, and the four weeks I have been living and breathing The End of the World Show. I thought I would write a series about my experience putting the show together -- as a journal for me and for anyone interested in the lessons I learned. This maiden post is about where the show came from. I mentioned this briefly in the NakYouOut interview, but it one of the first questions people ask me. I had been toying with a big, theatrical improv production for many years. Scotch 'n' Soda did a few mainstage improvised productions in the years before I arrived (and one while I was at CMU) -- and that idea was always appealing to me. 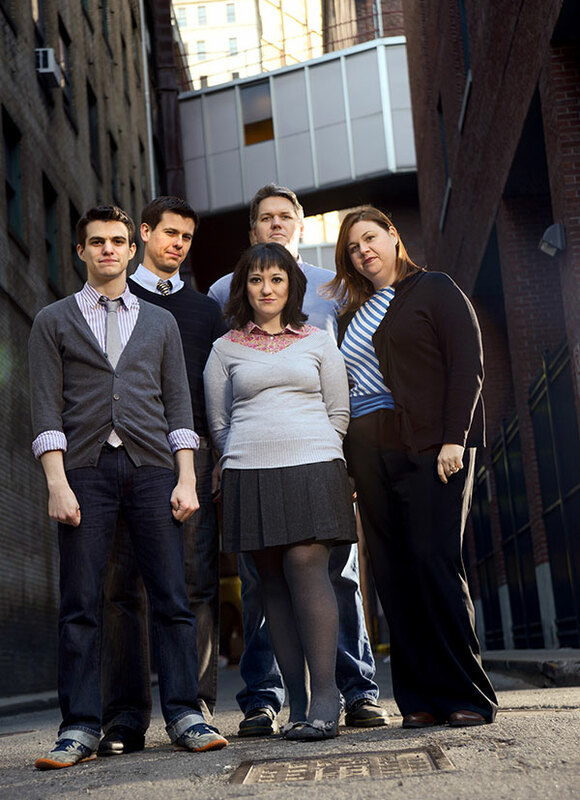 What if we did an improv show with a theater production schedule? Rehearse for a few weeks with a dedicated cast, put up a run of shows (build an audience, get some buzz in the press), and then all move on with our lives? I've also been wanting to do an envelope show. I knew the concept but the term I got from Asaf Ronen's book Directing Improv. He describes an envelope show as one in which the improv -- in this case, short form games -- are motivated by a frame story, an envelope. I loved the idea of building up characters in rehearsal then playing them over the course of 4 weeks. Those characters could grow and arc over the course of the show, and we could really take the audience somewhere even as we play games. And further, that the games themselves would be affected by the envelope. They would not have that "here's what we're doing can I get a location?" feel because the actors (in the plot) are not improvisers. They're just people trying to save the planet. The final motivation was of course that I believe all improv is about people. I want to see true human relationships on stage. So I devised a scenario in which this was of the utmost importance -- in which humanity itself was at stake. My lifelong attraction to space (see photo) naturally drew me to the alien dystopia but it was just a convenient narrative to put on top of these themes. Stay tuned! In the rest of the series, we will be looking at workshopping the form, the rehearsal process, collaborations, tech, press and more! You also have 2 more weeks to see the finished product!